USB 3.0 to SATA Adapter allows you to connect SATA HDD devices to your computer via USB port. It turns any SATA HDD device into a convenient external device. It offers USB 3.0 with a theoretical data transfer speed of 5.0GBit/s. That's ten times faster than the USB 2.0 speed of 480 MBit/s. It is a perfect portable device for everyone. It is ideal for you to backup files or upgrade your notebook/PC hard drive and allows you to connect any 3.5" or 2.5" SATA drive to your computer for fast USB 3.0 data transfer. Super-Speed USB 3.0 interface,support data transfer rates of up to 5Gbps.HDD files quickly and easily with the USB 3.0 to SATA adapter, Reverse compatible with USB 2.0 and USB 1.1. Compact design lets you take where are you to go, it's lightweight and easy to carry. 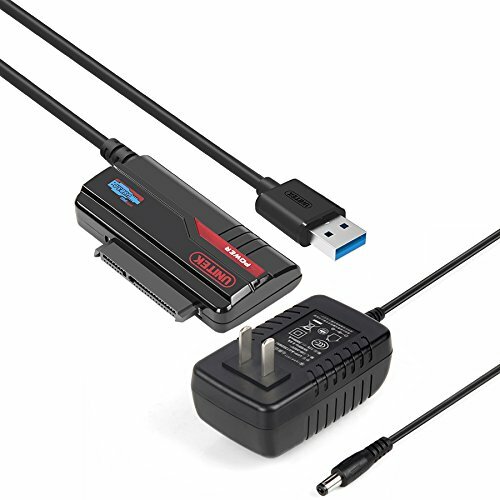 Plug and Play, Connect to the SATA device using USB interface, no drives required. If you have any questions about this product by iKKEGOL, contact us by completing and submitting the form below. If you are looking for a specif part number, please include it with your message.